CLAMP presented Japanese female athlete Sakai Yui with an illustration as an act of supporting her participation in the Winter Olympic games that is currently taking place in Vancouver, Canada. Sakai Yui plays in the Short Track Speed Skating competition. Apparently, Sakai Yui is a big fan of CLAMP and she used to go to the same Manual Therapy Center as CLAMP, they got to know each other through a mutual doctor from the clinic. Sakai Yui talks about the illustration in her official blog. You can check CLAMP’s messages of support in the Message section of CLAMP-NET.COM. This is so cool! 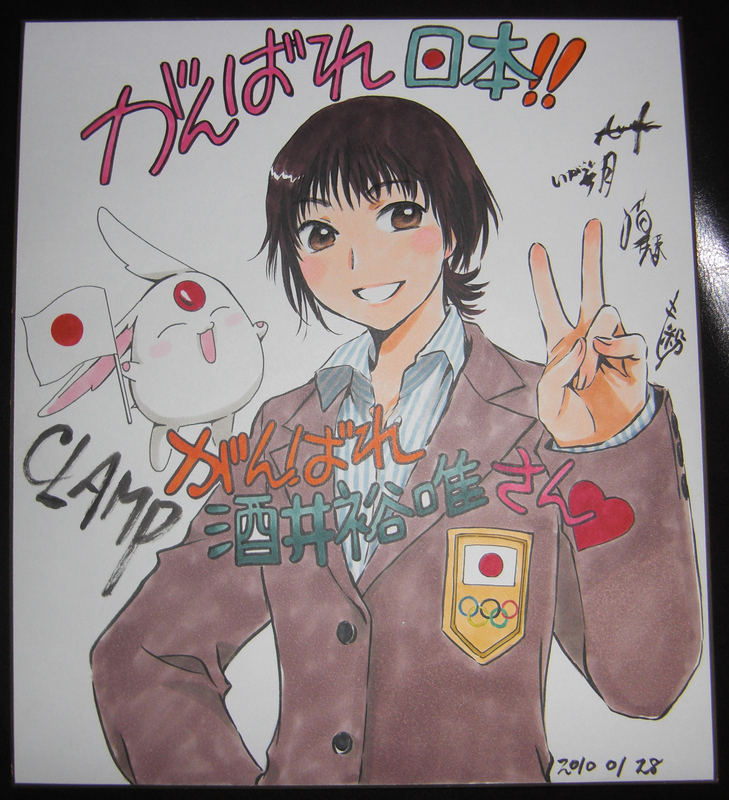 I thought it looked very much like her =D And that was a very nice gesture of CLAMP! It really was a nice gesture! Ohkawa says that they drew it immediately after they found out she would be going to the Olympics. I live in a city about an hour out of Vancouver, Canada. Some of the Japanese speed skaters were using out rink to practice before the olympics, and it was open to the public, so I went to watch! I’m hoping to see her compete on tv~! She lost the single race :(. But They just showed (I was watching the race right after I posted, lol) the relay race (3000m) and the Japanese team (including Sakai Yui) qualified for the “Final B”. I’m not sure what that means, besides that they will skate again! Here’s hoping they do well! So there’s another chance? =D Another category? Sakai is so lucky!! And actually, I thought it looked like Sakai even before I read the title XD CLAMP is amazing. So you knew her? This is the first time I hear of her. But then again, I know almost nothing about sports. I don’t follow it. But it does look a lot like her, it’s amazingly alike. to recognise it straight away! I must admit that I’m a little sad about her not qualifying on 500 m and not to arrive to the final A on 3000 m Relay. However, the second one was a hard one and the first one was really close, I mean a difference of 0.077s between the 2nd and the 3rd place is actually nothing, and there, the difference was the large of the leg and the blade, less than an step perhaps. However, it was really amazing, she started on the last place but on the past lap she fought for the first place (too exciting if you ask me). After all, it was a good competition actually; so I think she must feel proud of what she have done. Oh well not all is lost, the final B for 3000 m Relay is still to come, maybe she will not have a medal as in the final A, but at least she can win an olympic diploma which is also good. Here’s also hoping the best for the Japanese team on the final B. Thanks for sharing and Happy Valentine Day to you!! When exactly does she do the Final B?